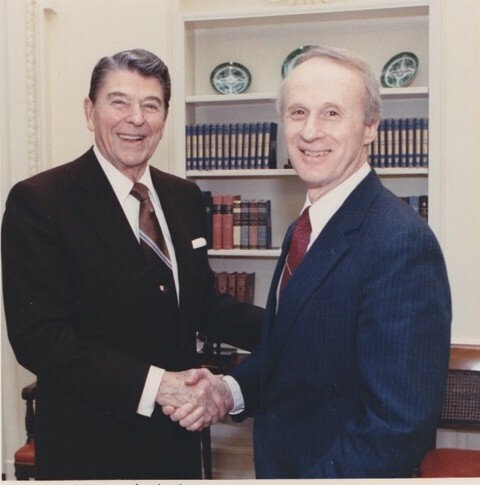 Barry Kelly shakes hands with President Reagan in the White House. from the University of Pittsburgh and a master’s degree from Duke. His career in the CIA included deep cover operations and overseas experience, primarily in South and Southeast Asia. He has been awarded the Certificate of Merit with Distinction, the Intelligence Medal of Merit, the Cross of Gallantry with Silver Star, the Distinguished Intelligence Medal and the Intelligence Officer of the Year Award. After retiring from the CIA, Kelly served as a special assistant to President Reagan. He holds a first dan black belt in hap-ki-do. Author Barry Kelly talks to a Rotary Club in South Carolina. Photo by Lloyd Mackall. Author Barry Kelly (far left) shakes hands with President Reagan. Kelly served as a special assistant to the president for two years in the 1980s. If I get enough comments like yours, I’ll bring the Brandon team to life again. Hello Barry, I enjoyed your book Justice Beyond Law. I had an idea come to me after reading it. You mention the towns of Greensburg and Latrobe, but not your home town of Jeannette. I think it would be great to name a character Jeannette in your next book. Sorry to hear about your sister-in-law’s medical problem. We never miss our good health until its gone. I wish you continued success. Woah! I’m really enjoying the template/theme of this blog. It’s simple, yet effective. A lot of times it’s hard to get that “perfect balance” between superb usability and appearance. I must say that you’ve done a great job with this. Additionally, the blog loads very fast for me on Opera. Superb Blog! Thanks for your comments. I have a sales manager for my novels who is very good at developing sites. Most of the credit goes to her. When Joan posted on “Bouvier & Friends Social Club” I immediately went to Amazon and ordered “Justice Without Mercy”! I have not read any books about spies and espionage (and did not know if I would like them) so I decided to read this one first and if it “caught” my attention read “Justice Beyond Law”! I immediately liked the characters and of course Shadow, so I savored the book–I am always disappointed to finish a book I thorougly enjoy–to me a hallmark of a really good book! After reading the last page I was “hungry” for more, so I ordered your first book! I wanted to know more about Jack & Kathy & Shadow, so reading “Justice Beyond Law” was like a flash-back! While I savored “Justice Without Mercy” to make it last I devoured this one–I think I read it in one day! Now I am “straving” for book number 3 !! I also have a name for the new Bouvier puppy–Gideon which means warrior, he could be called Giddy for short! Merry Christmas to Barry abd his merry band of followers from Road Rage and Dark Thirty, T. Allen Winn wishes you the best. Thank you for your interest. Please comment again. Have you ever thought about creating an e-book or guest authoring on other sites? I have a blog centered on the same information you discuss and would really like to have you share some stories/information. I know my viewers would enjoy your work. If you’re even remotely interested, feel free to send me an e-mail. Thank you for your comments. I love writing about things I’ve picked up over the years. If you get a chance read one of my novels. They are on Kindle and nook as well as in print. YOu can find them on the same web page as the blogs. on blogs I stumbleupon on a daily basis. It’s always exciting to read articles from other writers and practice something from their websites. a really well written article. I’ll make sure to bookmark it and return to read more of your useful info. Thanks for the post. I will definitely comeback. Barry, I just found out about your books from Sylvia. I’m Fred Bohn’s middle daughter. I’m going to buy them for my 3 sons who will love them. Lexie says to say hello. Thank you. Your father, in my early years, was like a big brother to me. In fact many of my clothes were hand downs from Fred. I”m very sorry the last years of his life were so difficult for all of you. Really Good Blog Ya Made Here.. Very Interesting Subject For A Post Keep Up The Interesting Work! I blog frequently and I genuinely appreciate your information. This article has truly peaked my interest. I will bookmark your blog and keep checking for new details about once per week. I opted in for your RSS feed as well. I seriously love your website.. Very nice colors & theme. Did you build this web site yourself? Please reply back as I’m hoping to create my own website and would love to find out where you got this from or exactly what the theme is called. Thanks! Hello, Neat post. There’s an issue along with your web site in internet explorer, would test this? IE still is the market chief and a huge part of other people will leave out your fantastic writing due to this problem. I worked for Barry when he was head of the CIA’s Office of SIGINT Operations back in the day and was very, very impressed with the way he handled that job. Not least in negotiating a treaty with NSA in how clandestine SIGINT operations were to be handled. Amazingly enough, he rose above bureaucratic rice-bowl considerations and did things that were right for the country. I also much enjoyed and frequently profited from his stories about life as a Real Spy in his earlier days. Would there were more like him.